Discover Paris through our pedestrian rallyes. Take a really original way to discover the architectural, historic and modern-day treasures of Paris by way of a ‘walking rally’ in teams, incorporating all kinds of riddles, sporting and recreational activities, all in a convivial atmosphere. Rally Paris invites you to explore the capital through its most well known and surprising facets in the company of a dynamic young team who will assure you of a great atmosphere and a successful event. A different itinerary for each team: - made up of 6-8 people, each group will be presented with a ‘road book’ and unique itinerary so the teams don’t follow each other. A member of staff will be present at several stop-off points to check that the teams are following the correct routes. 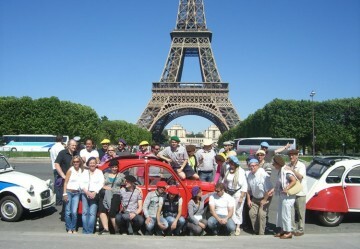 At the same time, a 2CV will serve as a refreshment point to the teams, offering water and cold drinks. Observation Rally – all the clues are accessible, and the answers can only be found at each point by looking (so as to avoid players checking the internet for answers on their phones), e.g. ‘Which of these four shapes corresponds to that of the garden at the Musée Carnavalet’? Between different stop-off points, players have to take unusual shots with a Polaroid camera supplied to them, to create something special which they can take away. Specific requests for shots can also be made, e.g. ‘Represent the company’s logo in a quirky way using at least five members of your team’. Several play challenges, supervised by staff, will spice up the race and allow the teams to win extra points – e.g. basketball games, tennis or petanque - in unusual venues within Paris (e.g. on the city wall of Charles V in the Marais). Debriefing in a Parisian park (Place des Vosges) – on the arrival of all the teams we give out the results and prizes for the first two teams (e.g. Parisian berets). 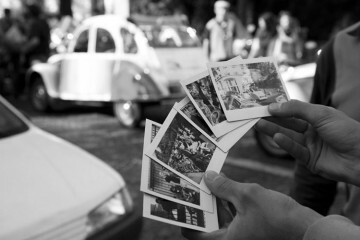 It’s ideal to finish off the evening or a dinner with a presentation of the prizes and a display of Polaroid photos. All the routes and stop-offs can be amended so as to meet the client’s own preferences in terms of setting off and finish points. For a quote and booking conditions, contact us.